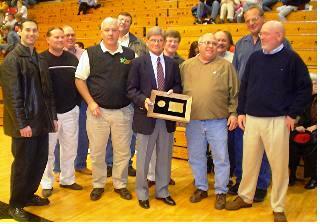 INDUCTED INTO THE KANSAS STATE HIGH SCHOOL ACTIVITIES ASSOCIATION HALL OF FAME, 1/24, 2004 AT HAYS KS. Click On The Links Below For More About Coach. PICTURED ABOVE FROM LEFT TO RIGHT: JOEY FRIEND, JAY FRIEND, CARL LEATHERWOOD, LARRY JANTZ, ROGER TIMKEN, COACH LARRY FRIEND, JIM COAST, SAM WEHKAMP, RITCHIE JANTZ, LARRY ADDISON AND BRENT MAGOUIRK. THIS WAS TAKEN AT THE INDUCTION CEREMONIES. Joey and Jay are Coach's sons and the rest are former Cimarron Players that were present at the ceremony. Here is some personal history on coach. He was born in the late thirties in S.W. Kansas and went to High School at Burdett Kansas where he excelled in all three sports, football, basketball and track. He then went to Dodge City Junior College where he again starred in those three sports. From there he went to Northwestern Oklahoma State College in Alva where he played football and ran track. After his college career ended he went to Cherokee, OK where he coached lady's basketball for one season. The next year he was the Junior High football coach in Cimarron, KS. The next year he became the High School football coach helping Cimarron achieve it's first winning season in some years. After six years at Cimarron Coach moved to Hayesville where he was the assistant football coach and head track coach. After a year at Campus High in Haysville as overall PE coordinator, coach took over the coaching job at Plainville, KS where in his twenty year stint as head coach took the Cardinals to two state championships along with many winning seasons. He later coached four years at Stanton County High School in Johnson, KS and now resides with his wife Joan in Syracuse, KS where Joan is an administrator at the high school and Coach enjoys his retirement with Golf, keeping in touch with friends, former coaches and players as well as other activities.